Hiking Coach Or Mentor: Do You Need One? Before you read about the difference between a hiking coach or mentor, let me acknowledge that you've been on this planet for awhile. So you have some idea of when you need a bit of help to get to the next level. Or the first level, if you're a beginner. As a hiker, you are no different than any other athlete. Working with a hiking coach or mentor will enhance enjoyment of the sport, and lead to new achievements on the trail. So what's the difference between being coached and being mentored toward a goal? So glad you asked, because it's a doozy. Let's fast track this, before getting into some specific hiking examples. It's about your time, commitment, and goals. Have a specific, well defined problem that you need and want to solve? You need a hiking coach with deep knowledge of what you're up against, and a big tool chest of tips and strategies. With a bit of help, it shouldn't take long to identify viable solutions, and analyze their effectiveness after you apply them. Have an issue or troublesome roadblock that keeps you off the trail? Something which is serious enough to prevent you from full enjoyment of hiking? That's when a relationship with a hiking mentor is beneficial. Investing time to explore your issue, and then working through possible solutions, is your best bet toward achieving success. A hiking coach works with you for short term, laser like focus on your problem. A hiking mentor relationship is a deeper commitment for the both of you, an investment in your long term success and goal achievement. Both a hiking coach and a hiking mentor will focus on you, offering tons of support and encouragement along with strategies to achieve your goals. But there is a difference in the approach. The hiking coach listens, then suggests a course of action. You receive suggestions and tips to improve, tweak, or change actions. You take another action (or try the same thing again with greater clarity), until the problem is solved. In a mentoring relationship, you enjoy a deeper focus on process. Together, you identify what's behind the problem or fear. You work at your own pace through the best approach to your challenge(s), using the mentor for guidance and support as you progress. When ready, you implement actions and course corrections on your journey toward your goals. Are the differences becoming more clear to you? Visualize a hiking coach as offering you a helping hand across a roaring stream crossing. Visualize a hiking mentor as a friendly face, standing on the other side of the stream and encouraging you to meet the challenges of crossing swift water. Your first hike - ever! ... you would like to get safer. Stronger. Smarter on the fundamentals as a hiker. ...or when you need support and encouragement to overcome a roadblock before you can get on (or back on) the trail in confidence. Design a strengthening and conditioning plan - and stick to it. Identify and address anxieties about the realities of the trail. Learn to work around physical and mental limitations. Conquer fear(s): wild animals, the dark, being alone, snakes, heights as examples. What else is holding you back from your hiking dreams? Maybe it's time to conquer it! “Achieving goals by themselves will never make us happy in the long term. You might be in the daydreaming phase, and need some help to get focused on a destination that fits your budget and abilities. Or perhaps you’re all set with destination and time frame, but need a bit of help with choosing gear, planning your menu, or trail realities like feminine hygiene and first aid. Maybe you're looking for the perfect way to mark a life event or celebrate a milestone. Or perhaps you're tired of wishing time away, and are ready to get serious. But the only way to get to your goal is to take action. And that means having a plan, and investing your time, energy, and money at whatever level makes sense for you right now. If you're ready to take a step toward achieving your goals, get more details about Metamorphosis here. Or contact me directly to get your questions answered. Or showing your photos to friends and family with a huge grin on your face? 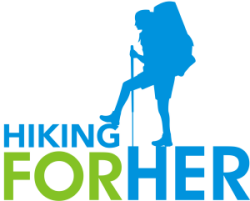 The Hiking For Her Metamorphosis invitation to move forward toward your hiking goals is waiting for you. Lots of choices for your own personalized, focused hiking coach or mentor plan. I don't hold myself out as a hiking coach or mentor lightly, and you are probably wondering why I'm qualified to offer you help. You can read more about my credentials, hiking and otherwise, here. Wishing you all the best today, dear hiker! Hiking Coach Or Mentor: Which Do You Need?